If you’re not drooling a little just with the title and the one photo you’ve probably seen of this amazing breakfast, you’re probably in the wrong place. Just click-on over to some broing recipe for cereal or bowl of yougurt with fruit on it. Don’t worry, I’m not judging. But if you’ve got a little drool on your chin, you’re in the right place–at the right time. 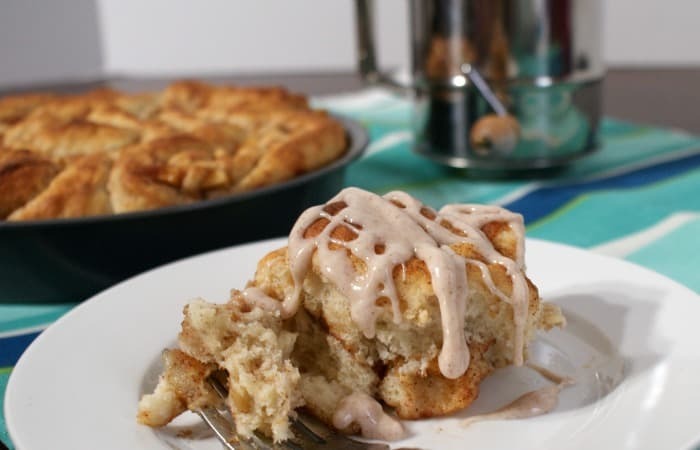 This recipe for Easy 1-hour Apple Pie Cinnamon Rolls is simply the best breakfast ever. I can’t believe I’ve never thought of this before. And we will be making them again. Regularly. They’re that good. As is generally the case for me, this recipe is dairy-free and eggless. So, allergy-prone-friends, you can enjoy some of this yum, too. You’re welcome. 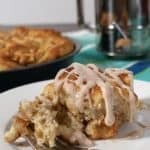 To make the dough for these amazing apple pie cinnamon rolls, mix the water, yeast, sugar and oil together. Add the salt, apple sauce and flour to the mixture. Mix together for 10 minutes using a dough hook on a big mixer (trust me). Turn off the mixer and let dough stand for 10 minutes. You’ll think: oh, this is so wet, it’s never going to make a cinnamon roll. Just slap that part of you silly and go on–it’ll work out, trust me. TRUST ME! While this is standing, peel the apple, slice and dice until it’s in little pieces, then place all ingredients for the filling into a small bowl and mix together thoroughly. Set aside. Lay-out a large piece of wax paper and spray liberally with your favorite oil-type cooking spray (I use a coconut oil spray). Do not use flour. Place the dough on the wax paper. Using your hands (a rolling pin simply won’t work right–I tried), flatten the dough into a large rectangle. Just be sure to coat your hands liberally in oil and this will totally work ok. I promise. Spread the filling mixture evenly across the entire rectangle of dough. Using the wax paper, lift the “short side” of the dough and roll the rectangle tightly-ish, but not too tight. Using a sharp knife, cut the dough into into 12(-ish) rolls. Place on greased cookie sheet or cake pan (I prefer a round cake pan so I can get that one cinnamon roll in the center that doesn’t have any crispy edges…mmmm…). Allow the cinnamon rolls to rise. You may allow them to rise to any height you desire. I recommend approximately 10 minutes–that makes for a super fluffy, fun cinnamon roll. Place in the oven and bake for 12-15 minutes. Remove from heat and allow to cool before icing. 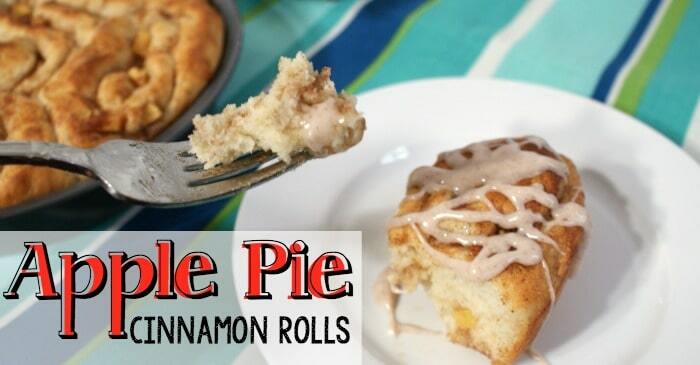 Devour your precious cinnamon rolls and begin again! 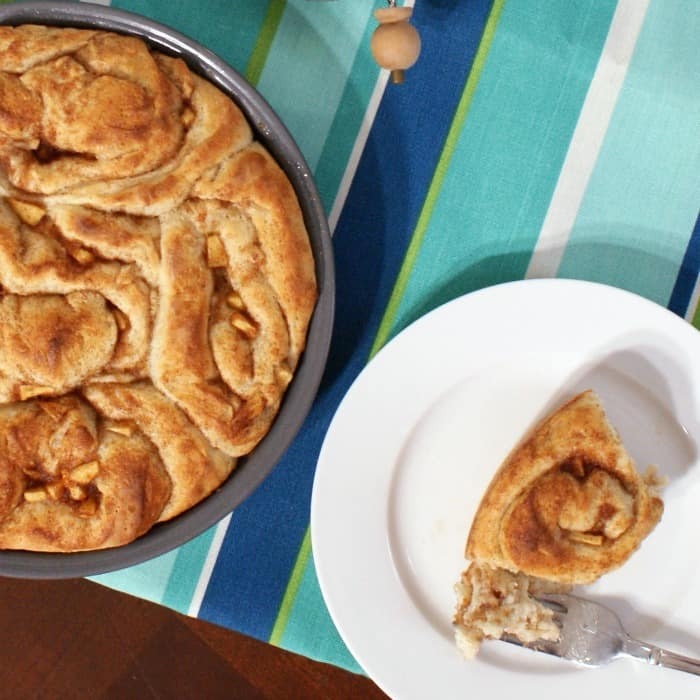 This recipe for Easy 1-hour Apple Pie Cinnamon Rolls is simply the best breakfast ever. I can't believe I've never thought of this before. And we will be making them again. Regularly. They're that good.